As promised in June, Apple on Thursday introduced its in-house payments solution Apple Pay to customers in Switzerland, offering initial support for both Visa and Mastercard credit cards. 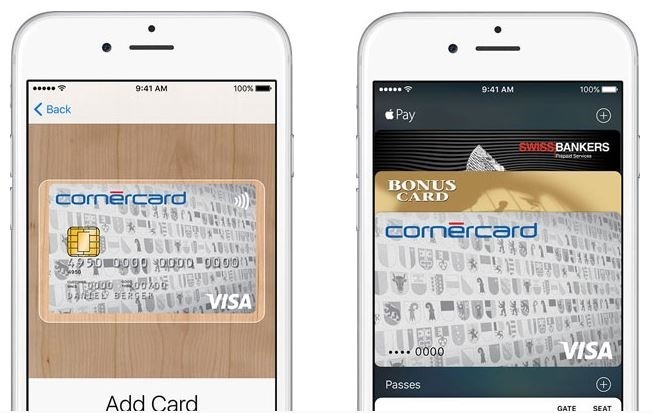 Announced through Apple's regional website, iPhone users in Switzerland who are also customers of Bonus Card, Cornercard or Swiss Bankers can now provision their credit and prepaid cards for Apple Pay. Reports from users within the country note Apple's end of the service is live, allowing them to add cards to Wallet. Owners might not be able to actually use the service anytime soon, however, as only eight major chains are listed as participating retailers, not including Apple's own Apple Store. Aldi, Avec, C&A, k kiosk, Mobile Zone, P&B, Spar, and TopCC are accepting Apple Pay transactions at launch, while Lidl plans to integrate the payments solution in the near future. Apple confirmed Swiss availability at this year's Worldwide Developers Conference in June. At the time, the company said France and Hong Kong would also gain access to the service, though an exact launch window was not announced. The service activation is the latest development in Apple Pay's measured international rollout. In June, Apple added backend integration with Canada's BMO, TD and Scotiabank, bringing the country's "big five" banking institutions into the fold. A week earlier, Apple Pay gained support from five major banks in Singapore. Apple Pay was introduced to U.S. consumers in 2014 as part of iOS 8, later expanding to Australia, Canada, China and the UK. As the service gains momentum in Apple's domestic market, the company is focusing future growth efforts in major markets in Asia and Europe. According to Apple Pay chief Jennifer Bailey, Apple plans to bring Apple Pay to every major market in which Apple products are sold.